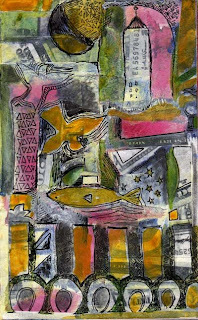 Fish Out of Water, Mixed Media, 5.5" x 8.5"
Today was pretty busy with a trip to the dermatologist and several biopsies. It's such a treat to be fair in Florida. After that ordeal, I came home and took a little nap before my art journaling class at Maitland Art Center. I know I don't get out much and my art room is a solitary refuge, but it was almost more than I could take. It turns out the class is sort of an open studio with people coming in and painting, collaging, doing pastel, everything under the sun--a lot going on and a lot of commotion. I'm apparently the only one doing journaling. Before I bolted for the door, I asked the instructor, Kaye Calloway, if it's like this all the time, and she said don't get scared off because it should quiet down after the first class. Even though she was spread thin with so many students, we talked quite a bit about artistic goals, earning a living from art (or not) and even hard to tame inferiority complexes. She seems like a very caring and astute person. I absent-mindedly doodled in a corner of the room on a page I had started in one of my sketch pads while taking in the chaos. Ironically, when I came home and looked at it again, I saw that it had an image of a fish out of water--the same way I felt in the class. Maybe there is something to this journaling thing.